We’d love your help. 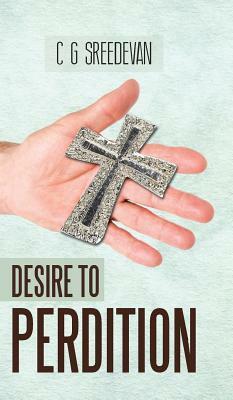 Let us know what’s wrong with this preview of Desire to Perdition by C.G. Sreedevan. To ask other readers questions about Desire to Perdition, please sign up. Desire! Every human has it and craves for it but ever wondered how it could lead to something as ghastly as Perdition? Well, the story is about an Indian middle class boy named Sijill John who is just another average guy going through his teens in the initial chapters of the book but as the prologue suggests something sinister through the past perfect which led to his present condition and state of mind. The journey begins with his narrative on how he spent his teenage years with his school class Desire! Every human has it and craves for it but ever wondered how it could lead to something as ghastly as Perdition? Well, the story is about an Indian middle class boy named Sijill John who is just another average guy going through his teens in the initial chapters of the book but as the prologue suggests something sinister through the past perfect which led to his present condition and state of mind. The journey begins with his narrative on how he spent his teenage years with his school classmates and how they played an important part in shaping his transition to adulthood. The plot is very pleasant with mischievous and playful youngsters and sails smooth until a setback for Sijill in the form of a separation from his love who obviously happens to be his classmate as well. Although he recovers very soon yet the impressions cast a shadow over his next relationship in his last years of college. His life still progresses but constantly reminds him of his past which he desperately wants to let go. If you thought this book is just a mushy love story then you will be proved wrong as the book turns serious towards the end with the protagonist’s brush with religious violence culminating with an event which leads him to self-realisation and pushing him towards Perdition. Will he be able to save her? Will she inspire him to love or hatred? Which path will he choose?